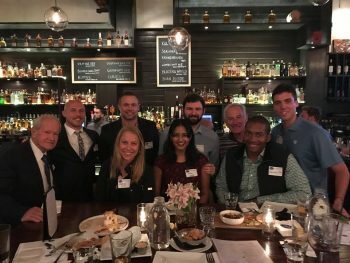 Alumni Chapters 2017-2018 Review What a busy year! As the saying (somewhat) goes, “Plan it and they will come.” Through the fantastic efforts of our 78 alumni chapters and more than 500 chapter volunteers, there were 293 alumni chapter activities held this past year ranging from simple happy hours to athletic tailgates to career panels to faculty presentations to alumni Fancy Dress Balls to presidential welcomes for President Dudley. In fact, the 2017 -18 Chapter year was so full that it averaged out to one chapter event every 29.9 hours! Take a look at this slideshow to see just some of the fun! Be sure to keep an eye on your email and our website for an alumni event near you. If you are not currently receiving email updates from your local alumni chapter, please logon to Colonnade Connections to update your contact information. Many chapters also have Facebook pages; check this webpage for links.